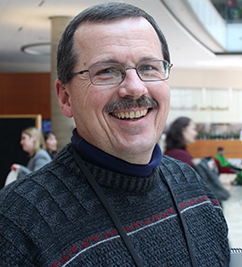 H. Gary Cook, Ph.D. is the senior director of assessment for the WIDA Consortium and is a research scientist attached to the Wisconsin Center for Education Research. Dr. Cook received his Ph.D. in Measurement and Quantitative Methods from Michigan State University. He has a Masters in Teaching English as a Second Language and a Bachelor’s in linguistics from the University of Hawai’i at Manoa. He has served in educational leadership or research positions in private industry, in an urban public school district, in a state department of education, and at the university level. He is an experienced Federal Peer Reviewer and serves on several state and national technical advisory committees. His recent research and publication interests have focused on the relationship between English language proficiency and content assessments, standards alignment, policy issues associated with English learner accountability in US K-12 schools, and in using growth models to address key educational questions for English language learners.